Navigating the various Buddhas and bodhisattvas can be a very confusing task. Every temple can seem filled with overwhelming imagery. 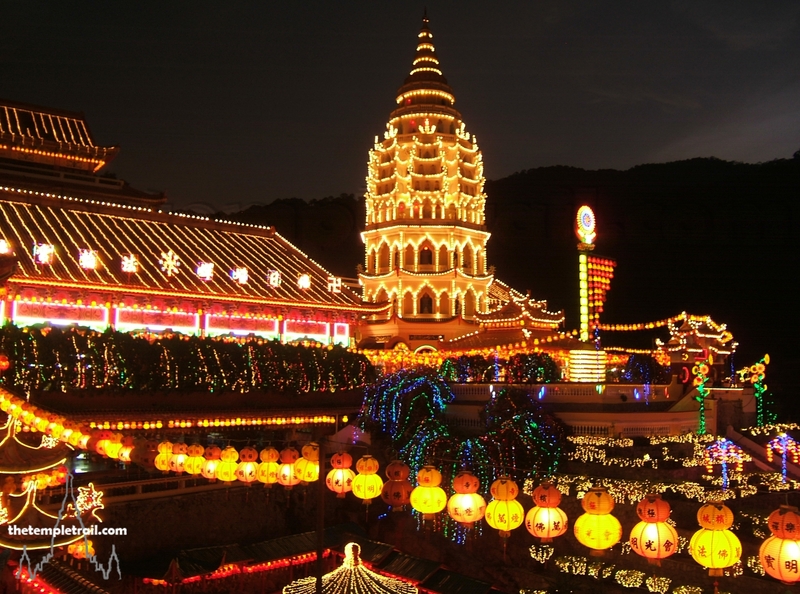 With a little knowledge, a visit to a Buddhist temple can be a rich and fulfilling experience that takes you through the heart of Buddhist philosophy. 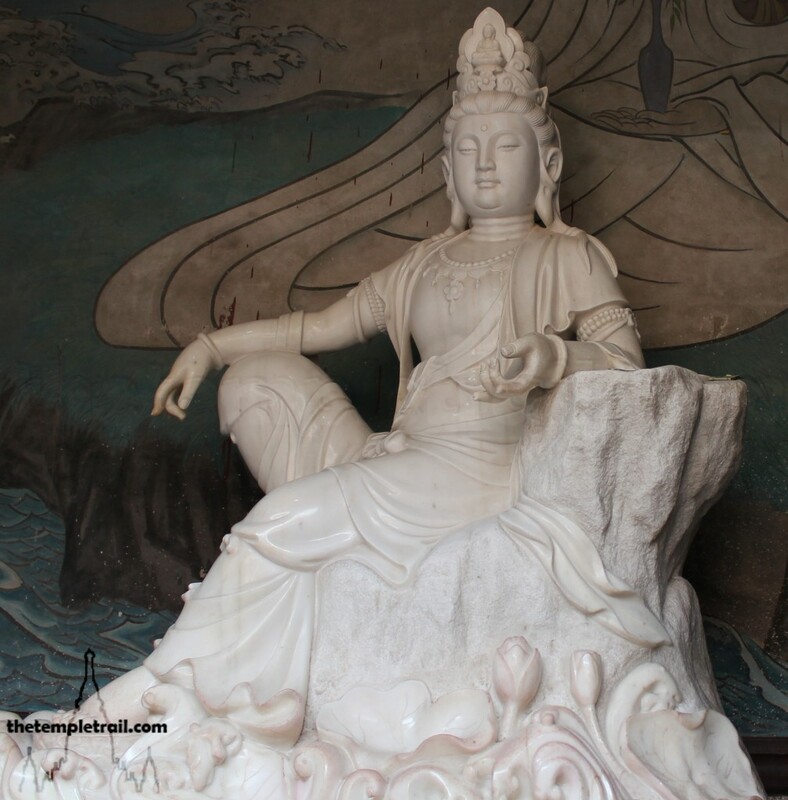 Each school of Buddhism has its own venerated figures, but all respect the Historical Buddha. Buddhism, although unified in many regards, is a sectarian religion. The three main branches are Theravāda, Mahāyāna and Vajrayāna. The oldest extant form is Theravāda, meaning the ‘Teaching of the Elders’. It is the southern school and has its roots in Sri Lanka. Generally speaking, it is most common in Southeast Asia. Mahāyāna, meaning the ‘Greater Vehicle’ is the next oldest and was transmitted from Northern India through China. It differs in many ways from Theravāda, but in the context of what this guide is concerned with, is known for revering Bodhisattvas more vigorously than Theravāda. You may occasionally hear the term Hīnayāna (Lesser Vehicle), but this refers to several defunct schools of Buddhism, not to Theravāda. Vajrayāna, the Thunderbolt Path, is actually a tantric form of Indian Mahāyāna Buddhism. It has all of the exoteric teachings of Mahāyāna, but has additional esoteric teachings. It originates in the Himalayan region. The various tantric deities of Vajrayāna are too numerous to go into in this essay, which concentrates on the other two schools. Throughout the development of Buddhism, local customs and traditions have been incorporated. This also led to indigenous deities and demons being absorbed into the pantheon. The origins of the depictions lies in the Greco-Buddhist kingdom of Bactria, in present day Afghanistan. Early Buddhism represented the Buddha with an outline of his footprint. This signified his presence. The Bactrians, with their history making statues of Greek gods, wanted a human image to worship. This in turn spread into neighbouring Gandhara and eventually was taken on by the Indian Gupta Empire. 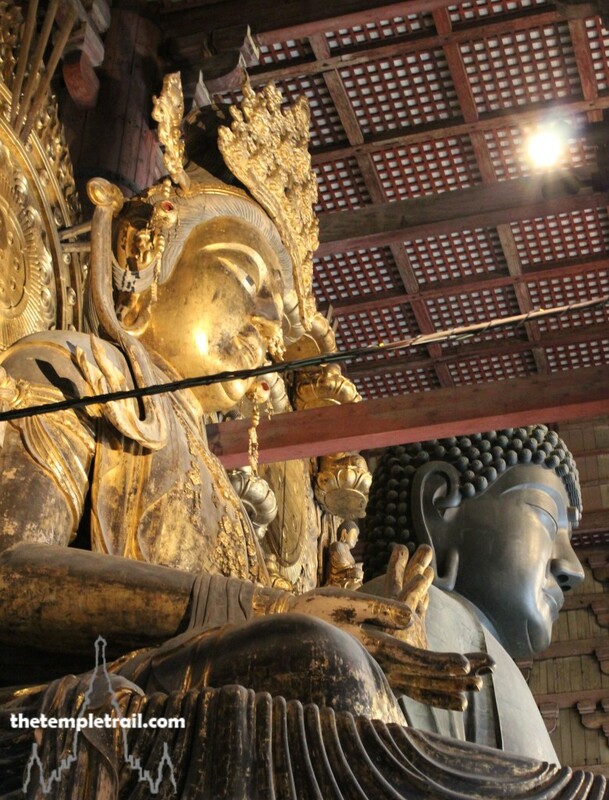 Today, we can see the legacy of the early Buddhists through the varied votive statuary seen around the world. Statues tell a story of who is being represented and what lessons we can learn. This is primarily done through mudras (hand gestures) and asanas (poses). By learning some of these, we can easily identify the being before us. The central figure of Buddhism is the man who was formerly Prince Siddhārtha Gautama. He was a royal of the Śākya Clan in the north of modern day India. About 2,500 years ago he renounced his royal life and became a holy man who taught the dharma; a set of teachings that he became aware of upon his enlightenment as the Buddha (Awakened One). Known by many names, he is commonly referred to as Śakyamuni (Sage of the Śākya), the Historical Buddha or simply the Buddha. He called himself Tathāgata (One Who Has Thus Come), referring to his escape from saṃsāra (the cycle of rebirth and suffering). He was sheltered as a prince from worldly suffering, but as an adult, he snuck out from the palace and encountered a sick man, an old man and a dead man. These visions made him realize that we are all subject to sickness, aging and death. He ran away, cut his princely locks and became an austere ascetic, starving himself in pursuit of enlightenment. After nearly dying, he had a vision of his childhood and realised that dhyāna meditation, not austerity, was the correct path. He had discovered the Middle Way and, after accepting a bowl of milk rice from a young girl, he went out to a pīpal or Bodhi tree to meditate. After 49 days under the tree and torments and temptations from the demon Māra, he gained enlightenment and became the Buddha at the age of 35. He then travelled the North of India and Nepal teaching the dharma, the Eightfold Noble Path and the Four Noble Truths. In a deer park in Vārāṇasī, he expounded the Wheel of Law (dharma) to five of his fellow ascetics and formed the sangha (fellowship of monks). His teachings grew in popularity and, when he passed into Parinirvāṇa (ultimate extinguishing) and exited the round of death and rebirth at the age of 80, the sangha numbered hundreds of bhikṣus (ordained monks). His teachings have survived and been added to over the past 2500 years. Original teachings are identifiable through the opening line ‘Thus I have heard…’ These sūtras (scriptures) are given in the voice of his cousin and personal attendant Ānanda. None of the teachings were transcribed during the Buddha’s lifetime. In Theravāda countries, there are eight day Buddhas. These are actually different aspects of the Buddha. Thailand is particularly noted for these and they can be seen in most temples and in other locations also. There are eight, as in the traditional cosmology, Wednesday is two days; morning and evening. They govern the fate of those born on their respective days. 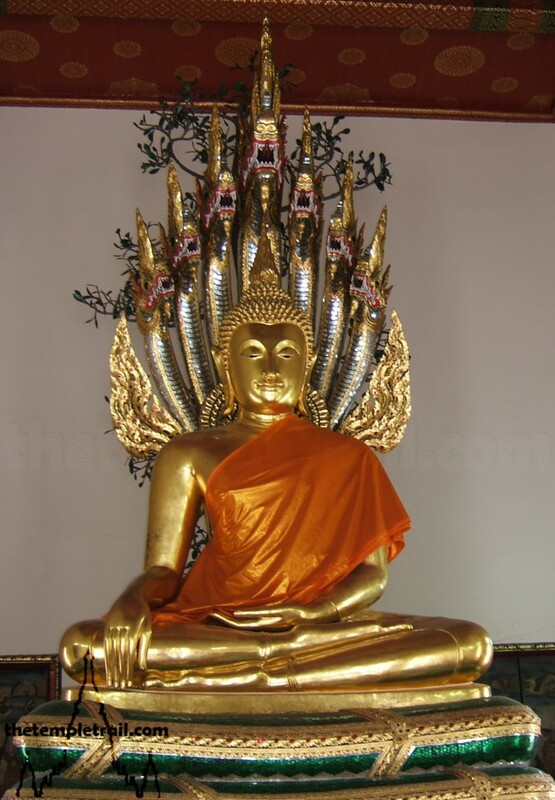 In Thailand they are: Phra Tawai Natra (Restraint) on Sunday, Phra Ham Yath (Making Peace) on Monday, Phra Sai Yas (Reclining) on Tuesday, Phra Um Bhat is the name of both of the aspects of Wednesday, Phra Samathi (Meditation) on Thursday, Phra Ram Pueng (Contemplation) on Friday and finally Phra Naga Prok (Protection) on Saturday. 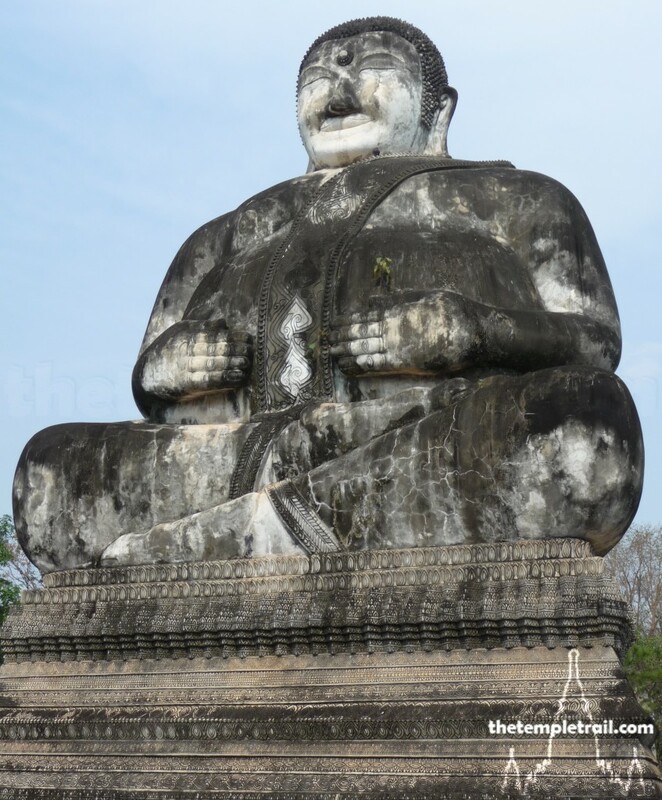 The Saturday Buddha is the most visually striking and thereby the most associated with Thailand. Phra Naga Prok shows Buddha being protected by the nāga Mucalinda (an eight headed mythical water serpent). Mucalinda is sheltering Buddha from the rain with his hood while he is in meditation. The Buddha sits on the coils of the nāga and under his hood. Dīpankara or Dīpaṃkara (Lamp Bearer) is one of the previous Buddhas mentioned explicitly by Siddhārtha Gautama. He is considered to the first to bring the dharma (the light) to the world. In his time, he met a hermit called Sumedha who he predicted would be a Buddha in the future. Sumedha would be reborn many lifetimes later as Siddhārtha Gautama. Other Buddhas mentioned by name by the Historical Buddha were Vipaśyīn, Śikhīn, Visvabhuja, Krakucchanda, Koṇāgamana and Kāśyapa. The Theravāda Buddhists in particular venerate 28 Buddhas that have already existed (Śakyamuni being the most recent). The five Dhayani or Jina Buddhas are meditation Buddhas mostly associated with Vajrayāna Buddhism. The five are transcendental and abide in the Pure Lands or Buddha Fields. They are Akṣobhya, Amoghasiddhi, Ratnasaṃbhava, Amitābha and Vairocana. Of these five, the latter two are both very popular outside of Vajrayāna Buddhism in the Mahāyāna schools. Amitābha is the Buddha of Infinite Light and lives in the Western Pure Land. He is very popular throughout East Asia. The Pure Land sect particularly adore him. They believe that if you pray to him, you can be reborn in his Pure Land. He is the spiritual father of the bodhisattva Avalokiteśvara and is sometimes depicted in the crown of the bodhisattva. Amitābha also has another incarnation as Amitāyus. In this form he has a container of the nectar of immortality, rather than a begging bowl or being empty handed. His red skin colour is lighter as Amitāyus, than as Amitabha. Vairocana, or Mahāvairocana is the Buddha that occupies the centre of the compass (the other Dhayani Buddhas are in each of the cardinal directions). He is seen as being the Sambhogakāya (bliss body) of the Historical Buddha and the embodiment of emptiness. He is often depicted on a lotus throne of thousands of Śakyamuni Buddhas in reference to a passage in the Brahma Net Sūtra that introduces Vairocana. 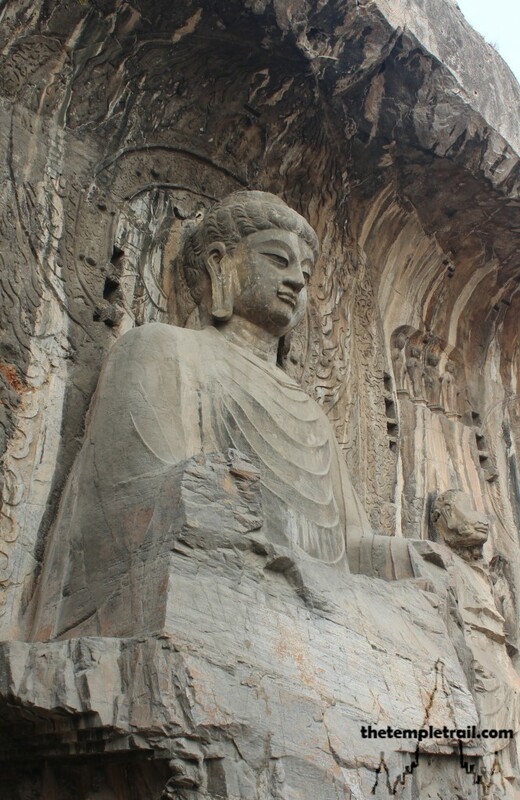 He is the central Buddha in many sects throughout China and Japan and is seen as a primordial Buddha. His statues are typically enormous and symbolically show that all conditioned existence is empty and without permanence. 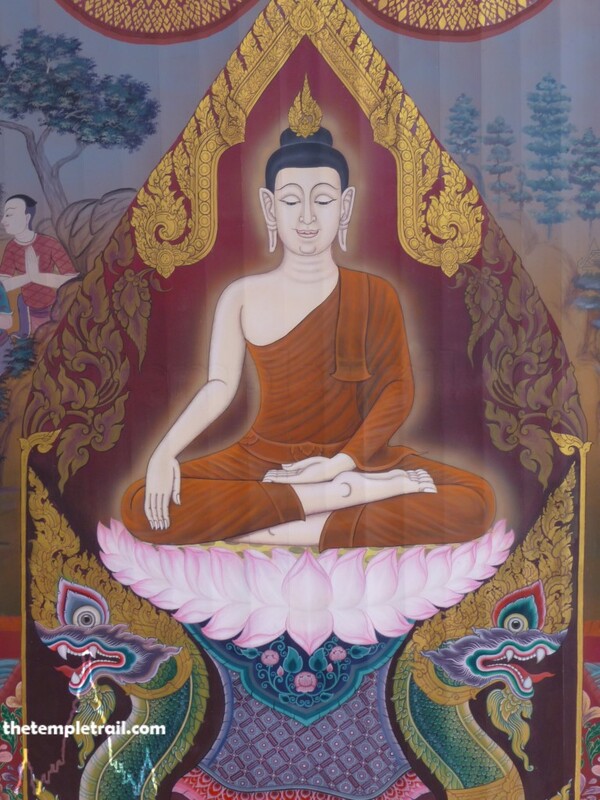 Bhaiṣajyaguruvaiḍūryaprabhārāja (Medicine Master and King of Lapis Lazuli Light) or more simply Bhaiṣajyaguru, is the Medicine Buddha of Mahāyāna Buddhism. He is seen as a great healer who can cure all ills and sicknesses with his teachings. His origins lie in the fact that Śakyamuni sometimes referred to himself as the healer of suffering in the world. In this regard, Śakyamuni is depicted with seven healing aspects surrounding him, one of which is Bhaiṣajyaguru. Over time, this aspect became depicted and revered separately. He is blue in hue and holds a medicine bowl and the healing herb myrobalan. 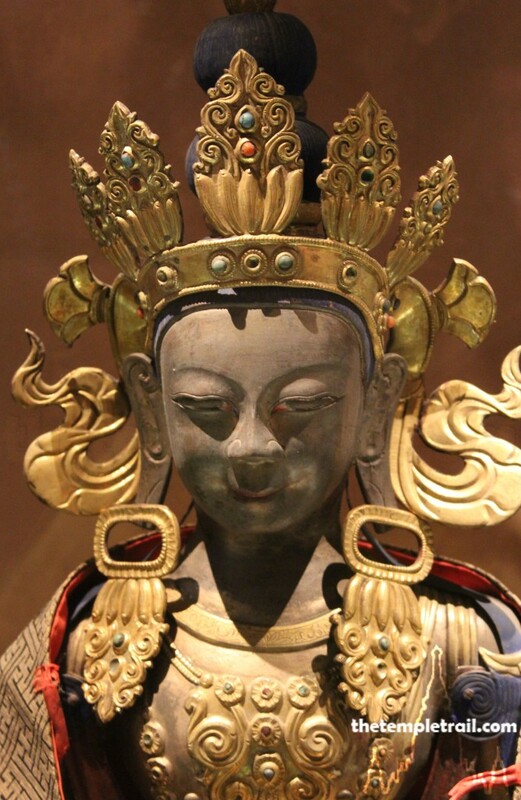 Maitreya is both a bodhisattva and a future Buddha. He is currently a bodhisattva named Nātha, but his predicted Buddhahood will occur in the future. It is said that he will revive the dharma in a time that it does not exist anymore. He is revered by all of the sects and has been depicted since early Buddhist times. 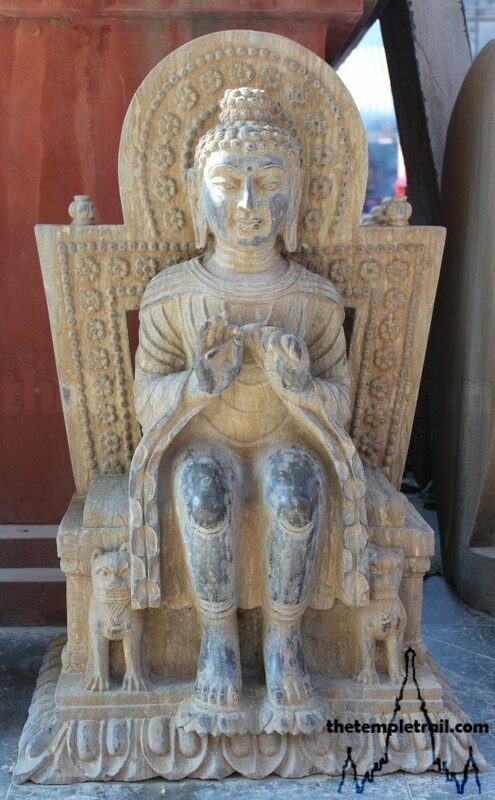 Although some older statues show him in lotus position and standing, he is normally seated on a throne with both feet on the ground. This is an indication that he is yet to be enthroned as a Buddha. It is said that when he is reborn on earth, he will gain enlightenment in the minimum seven day period. He currently resides in the Tuṣita heaven, one of the deva realms, as he awaits rebirth. Tuṣita is where Siddhārtha Gautama waited as the bodhisattva Śvetaketu before his rebirth as the Buddha. Avalokiteśvara (Lord Who Looks Down) is one of the earliest bodhisattvas (one in search of enlightenment) in Buddhist iconography. Although he is mostly a Mahāyāna ‘saint’ (as are all of the bodhisattvas), he is commonly part of Theravāda worship, particularly in Sri Lanka where he is called Nātha. 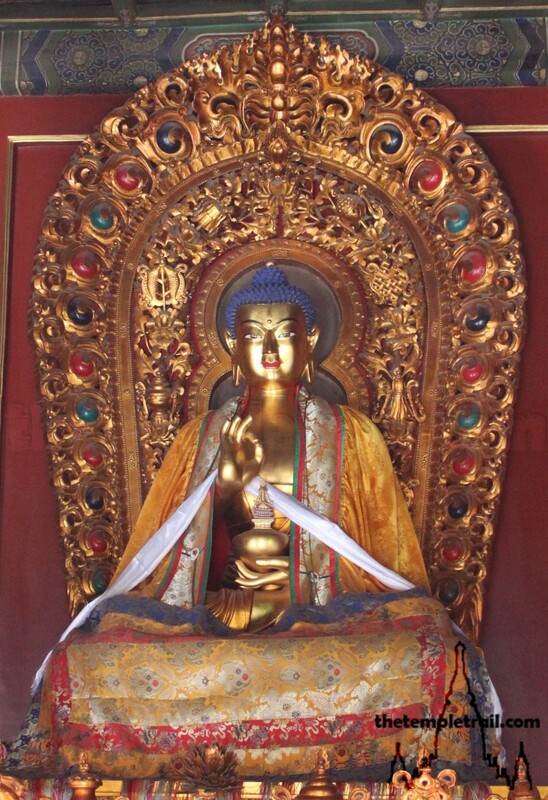 He is the personification of compassion and is often depicted alongside the Historical Buddha. He is the most important bodhisattva and is the most commonly seen in temples. He has always had effeminate characteristics and is somewhat androgynous. He has many incarnations, one of which is the Chinese female aspect Guānyīn. Among his commonest incarnations are Padmapāṇi, Sahasrabhuja-Lokesvara and Guānyīn. Padmapāṇi is the oldest incarnation of Avalokiteśvara. He helps in cases of desperate need and delivers all beings from saṃsāra. He is usually in a tribhanga (three bend standing pose) and wears the five pointed crown of the conqueror of the world. He also wears a gazelle skin. Sahasrabhuja-Lokesvara is the ‘one with a thousand arms’. 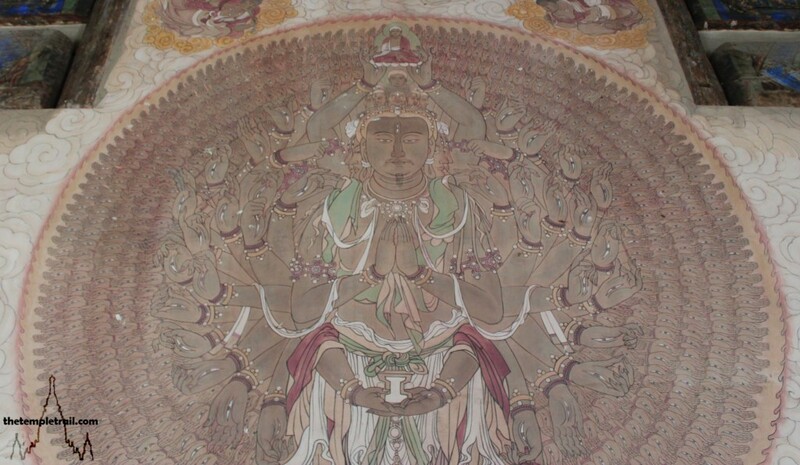 He is depicted with eleven heads and a thousand arms. Each hand has an eye on it and one of the heads is demonic to ward off evil. The eyes and hand are there so he can see all and help all of those in need in all of the worlds and planes of existence. The hands form a mandala or nimbus around him. Sometimes Guānyīn is depicted in the same way. 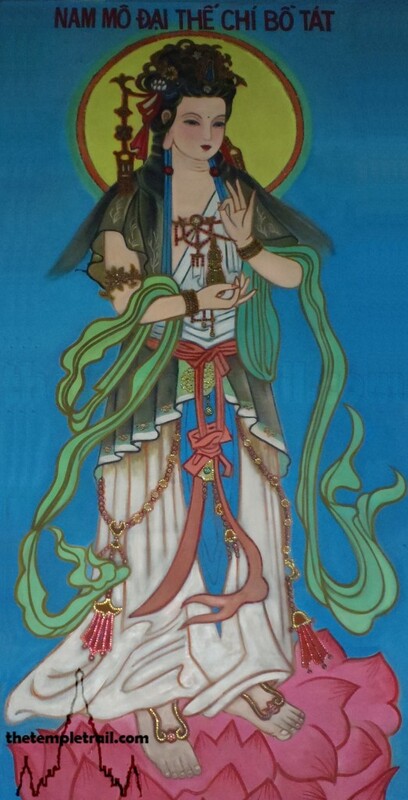 Guānyīn is of Chinese origin and is part of the Taoist pantheon as the Goddess of Mercy. 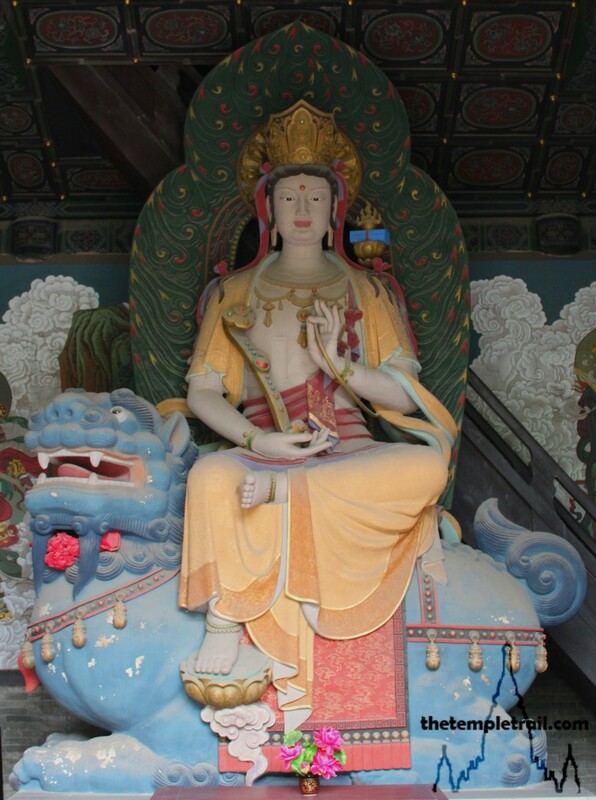 Guānyīn is the most commonly visible version of Avalokiteśvara in East Asia and can be found throughout the Buddhist world. She is a beautiful woman dressed in white robes and she wears a crown that has Amitābha on it, symbolizing the spiritual fatherhood of him to Avalokiteśvara. She is often attended by a young boy (Sudhanakumâra) and girl (nāgakanya). Vajrapāṇi, alongside Avalokiteśvara, is one of the oldest bodhisattvas. He is the first dharmapāla (dharma guardian) and symbolizes the power of the Buddhas. He is the protector of the Buddhas and was originally modelled on Herakles (the Greek demi-god) in Gandharan art. He is often seen as a yakṣa (an ogre or chthonic spirit) and is very rarely depicted in his basic form. Normally he is depicted in his incarnation as the pair of Temple Guardians in China and Japan. In Japan, these guardians are called Nio. 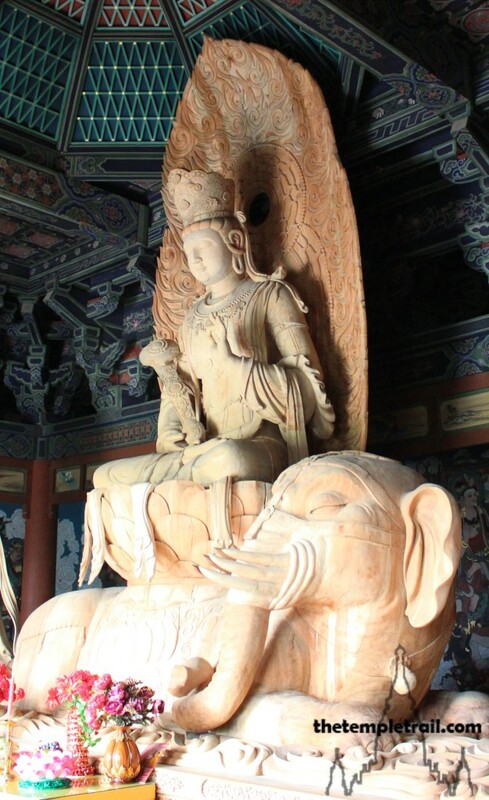 Vajrapāṇi is known as Mahāsthāmaprāpta in Pure Land Buddhism and in many Chinese temples. Mañjuśrīkumārabhūta or, more commonly, Mañjuśrī (Gentle Glory), is one of the most significant and universal bodhisattvas. He symbolizes prajñā (transcendental wisdom) and is a collector of the Buddhist dharmas. He is the bodhisattva of learning and, in his most common form of Arapacana (Splendid Melodious Voiced One), holds a flaming sword that cuts through ignorance in his right hand (the male side) and a book in his left (the female side). He is an eternally handsome young prince and is often shown riding on a lion. In his form of Caturbhuja he has a bow that symbolizes accuracy of speech and as Namasangiti he is twelve armed and making the Uttarabodhi mudra (gesture of supreme enlightenment). Samantabhadra (Universal Worthy) is the bodhisattva of practice and meditation. He is often in a trinity with Śakyamuni and Mañjuśrī. He is the action aspect to balance Mañjuśrī’s wisdom element. He is shown riding a white elephant and compels adherents to put their learning into practice. Although he is a Mahāyāna bodhisattva, he is revered in Sri Lanka as Saman, the rising morning sun god and protector of Buddhism and the island. Kṣitigarbha (Earth Treasury) is the bodhisattva of hell beings. He is responsible for spreading the dharma to all beings of the six realms (hell, preta or hungry ghosts, animals, humans, asuras or angry gods and devas or gods) until the arrival of Maitreya. He vowed not become a Buddha until all of the hell beings were enlightened. In East Asia he is a protector of the dead, particularly children. He is often found in sections of temples dedicated to ancestor tablets and is one of the most easily identifiable bodhisattvas. He is normally depicted as a Chinese monk with a fully tonsured head, often wearing a monk’s hat. He has a halo and carries a khakkhara (monk’s staff) to pry open the doors of hell and a glowing cintamaṇi to light the darkness. He looks quite similar to the monk Xuánzàng. Ākāśagarbha (Boundless Space Treasury) is the bodhisattva of ākāśa (the space element). He is the twin brother of Kṣitigarbha and his wisdom is as boundless as space. He is often depicted with a sword and a cintamaṇi. Ākāśagarbha is particularly important in Japan. Kūkai, the esoteric master and founder of the Shingon sect, promoted him as a result of his own meditations on the bodhisattva. 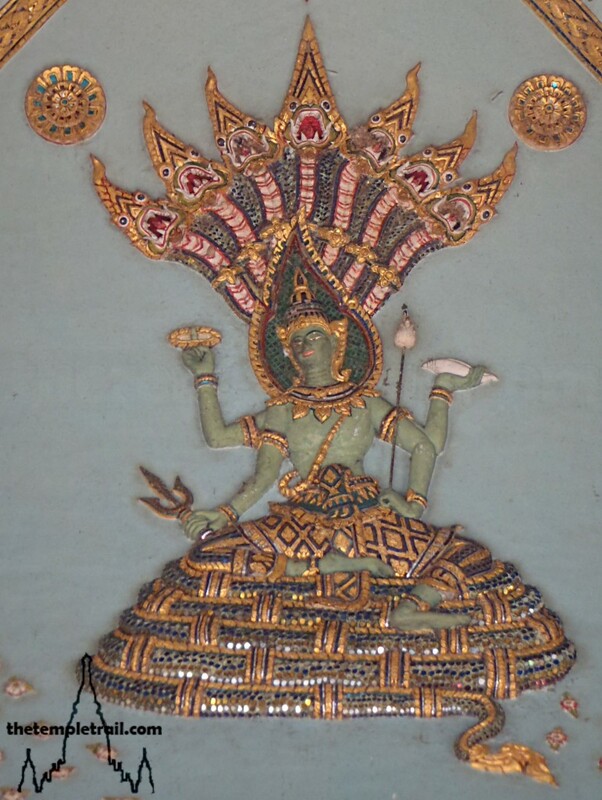 Sarvanivāraṇaviṣkambhin is another of the main bodhisattvas, but is not often seen in temples. He is a meditation helper who can remove obstacles. He holds either a flower or cintamaṇi (jewel) and is not as commonly revered as the other main bodhisattvas. Kātyāyana was one of the original ten disciples of the Historical Buddha and is popular throughout Southeast Asia and the Theravāda Buddhist world. He is a large bellied figure and came from a Brahmin family. He studied the Hindu Vedas under Asita, the holy man who made the prediction of Siddhārtha Gautama’s future, before gaining enlightenment from listening to the Buddha expound the dharma. He is often found in Thailand, where he is known as Phra Sangkajai and can often be confused with the Chinese Bùdài. Unlike Bùdài, he has hair and wears and over the shoulder Theravāda robe. Bùdài (or Hotei in Japan), also known as the ‘Laughing Buddha’ (Xiào Fó), is not a Buddha at all. 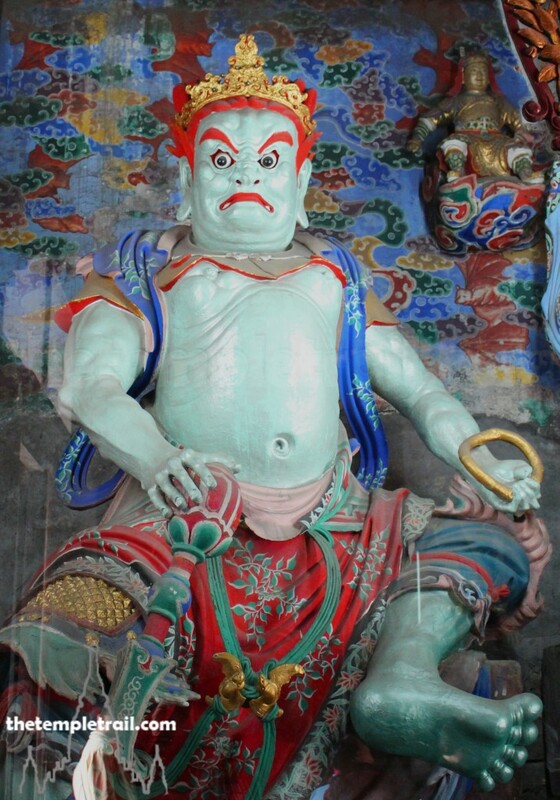 Often associated with Maitreya in China, he is sometimes called Mílèfó. 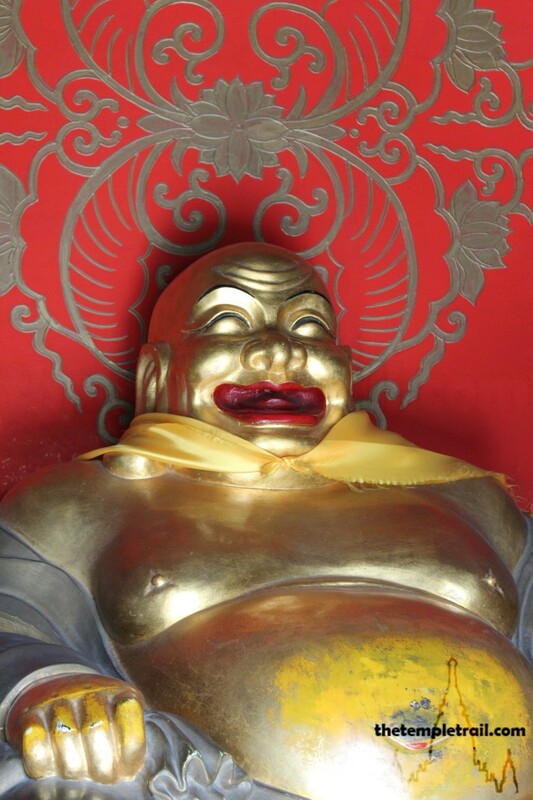 The fat laughing figure is actually a 10th century Liang Dynasty Chán (Zen) monk called Qiècǐ. He is popular throughout Mahāyāna East Asia and is seen as the embodiment of being poor, but content. His name means sack cloth in reference to his travelling bag. He is normally found at the front of temples and is clearly distinguishable by his bald head and enormous belly. He is always laughing and sometimes has a retinue of children playing with him. He can sometimes be confused for Kātyāyana, but his robes are open and he has no hair, unlike the top-knotted Kātyāyana. Pindola Bharadvaja is one of the earliest arhats. The oldest stories tell of four arhats (disciples) being instructed by the Buddha to propagate the teachings and Pindola was one of them. He is said to have been blessed with occult magical powers that got him in trouble with the Buddha on one occasion. 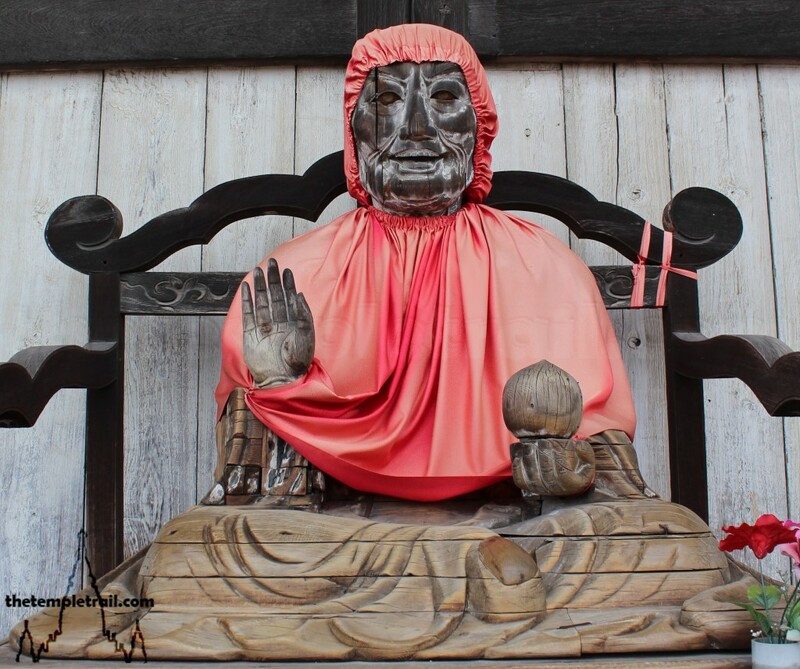 He is mostly found in Japan, where he is called Binzuru and seen as an embodiment of all arhats. 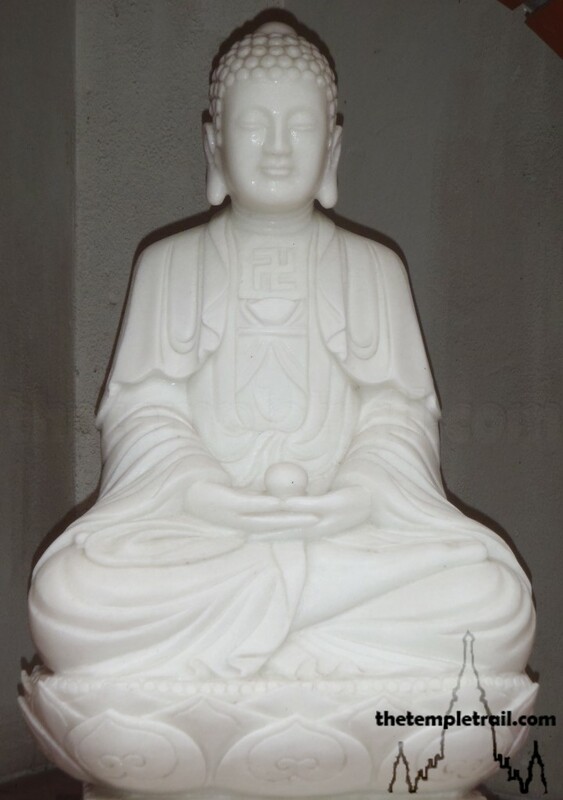 He is invoked for healing and his statues are normally rubbed in the area that worshippers wish healed. He is usually seated in lotus position, carries a sutra box and is dressed with a red bib or cape. 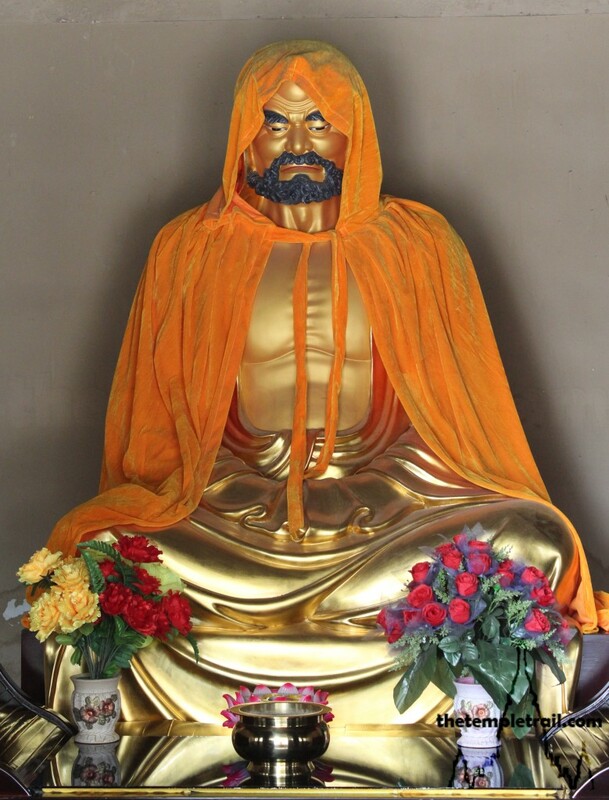 Bodhidharma was a 5th or 6th century Indian monk. He travelled throughout China teaching Chán or Zen Buddhism. Zen is a form of Mahāyāna Buddhism that emphasises direct personal insight. The bearded figure is always easy to recognise, as he is normally South Asian in appearance. Other figures are adapted to look like local people, but Bodhidharma maintains his providence. He always has a thick beard, is bald and robed. The Japanese Daruma doll is based on him and the legend that his legs fell off from atrophy after sitting staring at a wall for nine years in search of enlightenment. He is also said to have cut off his eyelids to stay awake and to have introduced lúohànquan (arhat boxing) to the Shaolin Temple. Xuánzàng was a 7th Century Tang Dynasty Chinese Monk who brought back the complete Buddhist sutras to China. His pilgrimage that took him through warring territories of Göktürks in Uzbekistan, through modern day Afghanistan to India and back, was immortalized in Wú Chéng’ēn’s iconic Journey to the West. The novel is fantastical, but the real journey, taken without permission through closed borders and to major Buddhist, Hindu and Jain pilgrimage sites is just as marvellous. The monk returned as hero to the Chinese capital of Cháng’ān (now Xi’an). 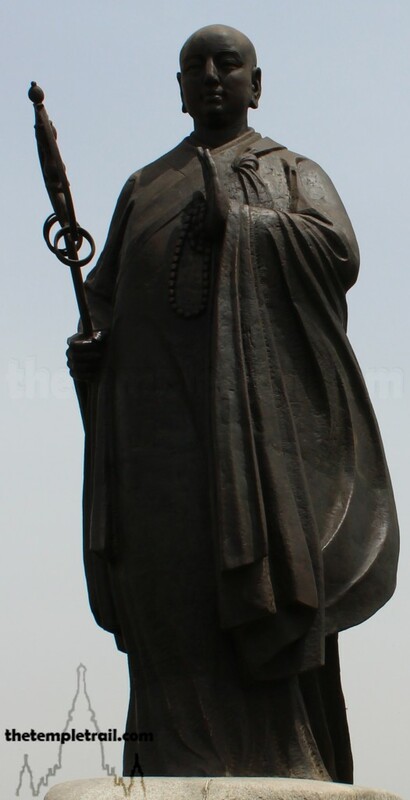 His statue is easy to distinguish as he is normally in a walking pose, carrying a xīzhàng (khakkhara) and has a fully shaven head. Due to his features, he can often be mistaken for Kṣitigarbha. Two figures have been adopted by Mahāyāna temples as Dharma Protectors. The two warriors vow to look after the teachings and protect those who practice them. The first is Guān Yǔ, a Chinese general of the Kingdom of Shu during the Three Kingdoms Period (220 – 280 AD). He is a folk hero and very much part of traditional Chinese Taoism and Shenism. 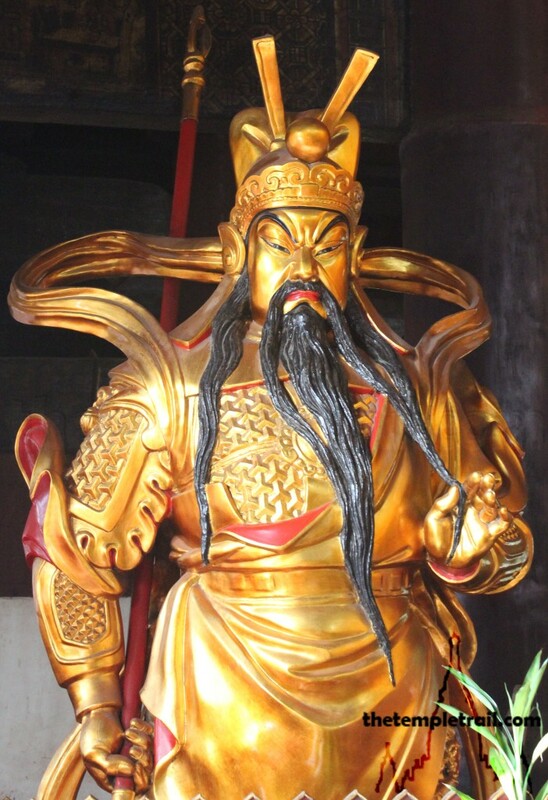 This red or gold faced and bearded figure can be seen at the entrance of the main hall of many temples in China, opposite his fellow warrior Wéituó. He carries a halberd and has a stern expression. His usage is a classic example of non-Buddhist entities being brought into the pantheon. The same can be said for his companion. Wéituó is also called Skanda and is often seen alone at Buddhist temples. He is armoured and carries a vajra mace. He is possibly an incarnation of the Hindu war god Murugan, who is also known as Skanda, though the two figures may have developed separately. He is said to particularly reside over relics and the sangha. The slightly chubby, angelic looking figure has a serene expression to counter that of Guān Yǔ. The Four Heavenly Kings are protectors of the directions and rulers of different beings and parts of the Buddhist cosmos. 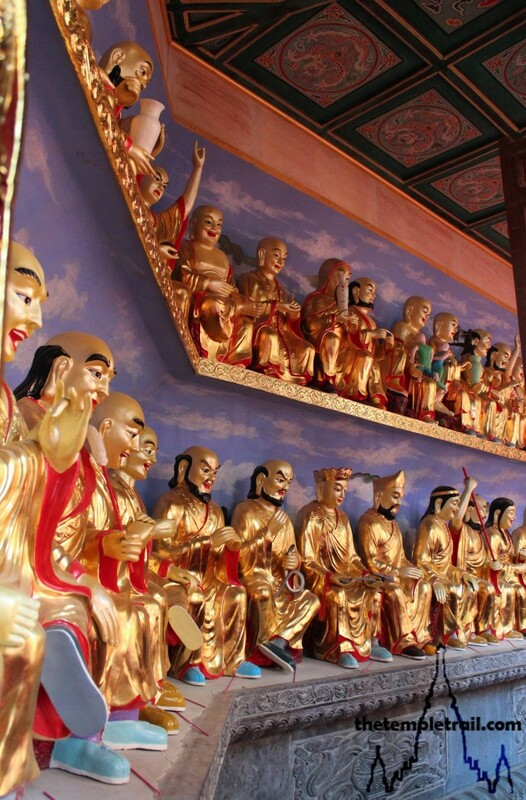 For more on the Heavenly Kings please see Chinese Buddhist Temples 101. Brahmā is traditionally the Hindu creator god and part of the trinity along with Śiva (Shiva) and Viṣṇu. 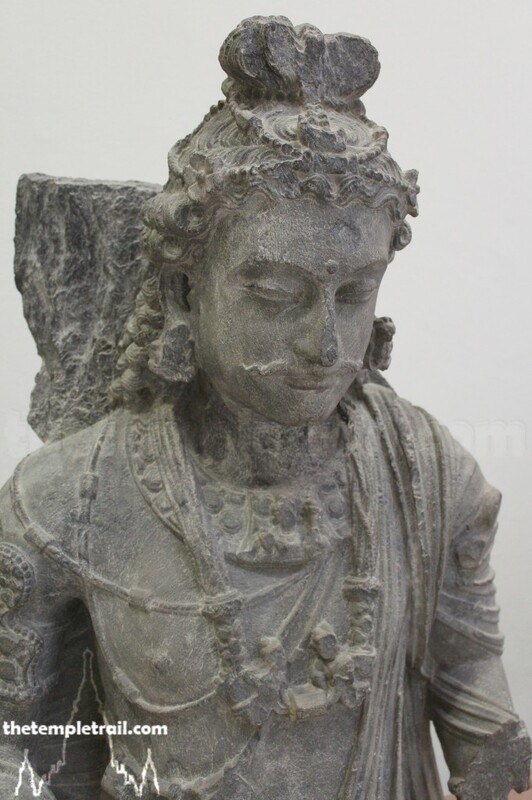 In Buddhism, he represents a whole category of devas (gods) in the form and formless realms. In Thailand, he is a common figure in shrines and is much revered by the people. 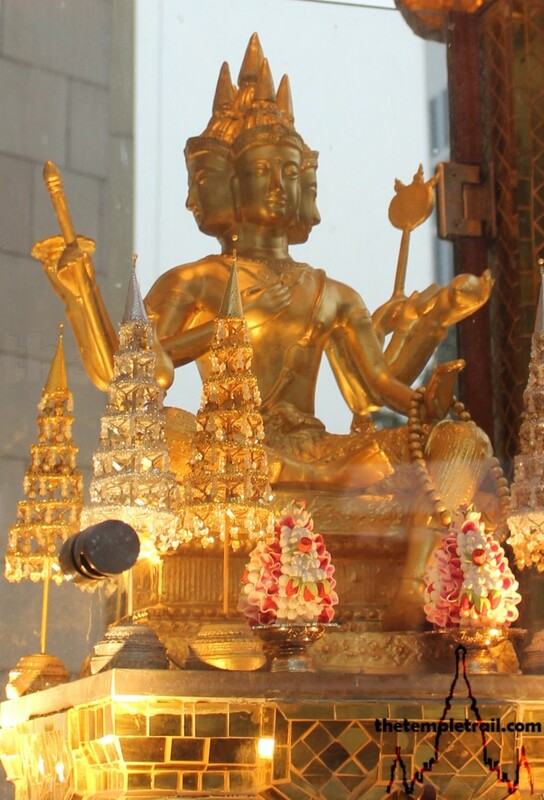 Known as Phra Prom, he is seen as a god of protection and fortune. 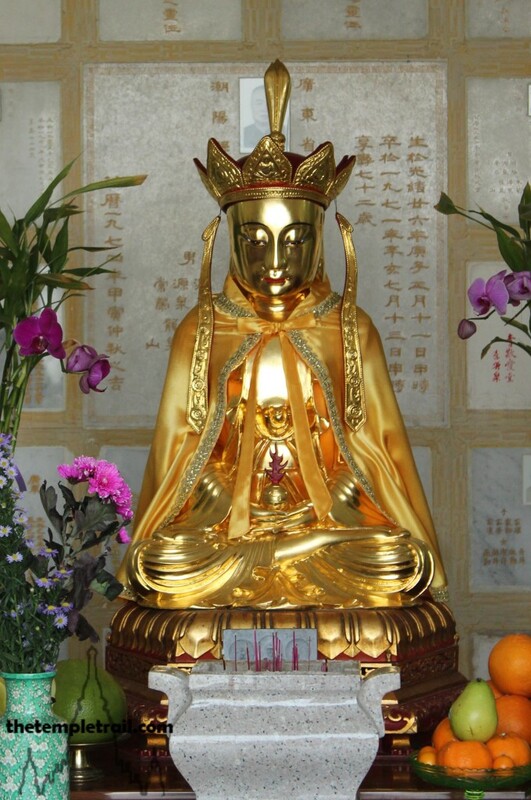 Called Sìmiànfó (Four-faced Buddha) in Chinese, he has become popular in Hong Kong, Shanghai, Taiwan and Macau also. He is recognisable by his four faces and his regal posture on a throne. He is almost always completely golden. Viṣṇu (or Vishnu) is a Hindu god and is not traditionally part of the Buddhist pantheon. In Southeast Asia, he can often be found in some of the temples, but is particularly noticeable in Laos. This is due to his association with Śeṣanāga (Shesha, the nāga king). Nāgas (mythical serpents) are still worshipped in Laos and are generally accepted all over Southeast Asia. He can be hard to make out, but he is normally depicted resting on the multi-headed nāga with his Panchajanya (conch shell) in his left hand. He is armed with a Sudarshana Chakra (spinning disk) and Kaumodaki (his mace). He is also blue skinned. Indra, also known as Śakra, is the original Supreme Being in Hinduism. The Buddhists believe that he was converted by the Historical Buddha and vowed to protect Buddhism for the current 2,500 year period. Śakra is the king of the devas and rules the gods in the Trāyastriṃśa heaven. His full title is Śakro Devānām Indraḥ and he is easily recognisable by his green skin. He is normally portrayed riding his elephant Airavata (Erawan in Thailand). 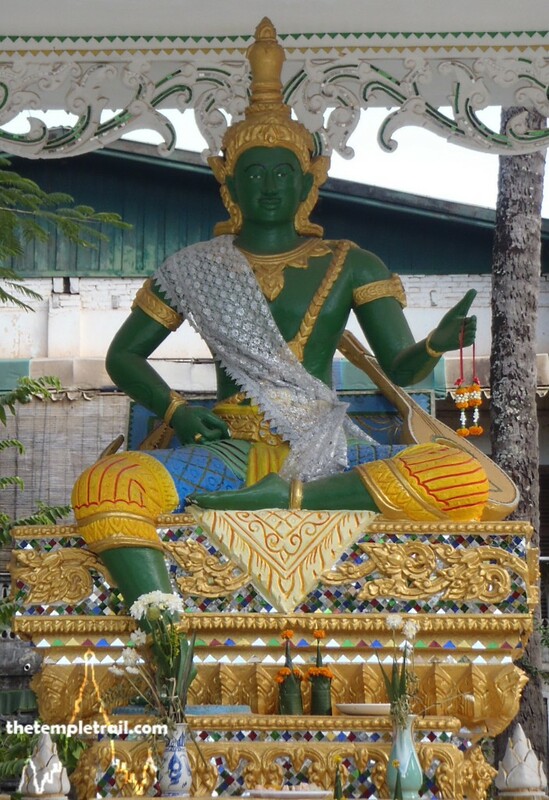 Śakra is particularly popular in Theravāda countries like Thailand and Myanmar (Burma), where he is the king of the nats (devas) and called Thagyamin. 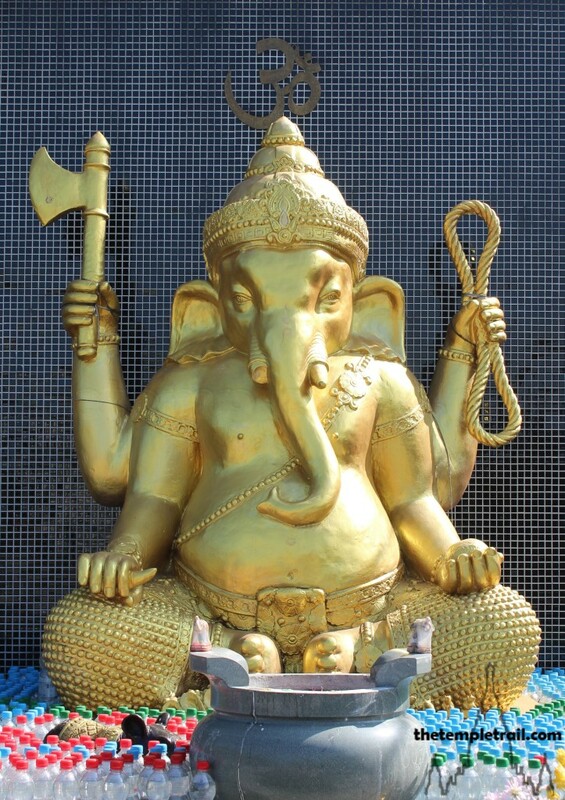 Gaṇeśa or Ganesh, the elephant-headed Hindu god is another being to come over from Indian religion. He is associated with wisdom and removing obstacles, so has become part of the Southeast Asian Buddhist pantheon. He is a hangover from the Hindu past of the region and from the co-existence of the two religions. In Thailand, he is a god of success. The Mahāyāna Buddhists see him as a god and a demon called Vināyaka and in various other forms.